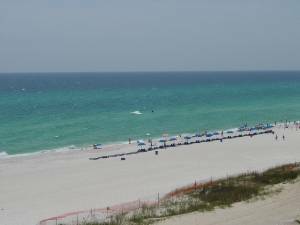 This Unit Features a Full Unobstructed View of the Crystal Blue Gulf Waters and the Beautiful White Sand Beaches of Panama City Beach! It is truly RIGHT on the beach. 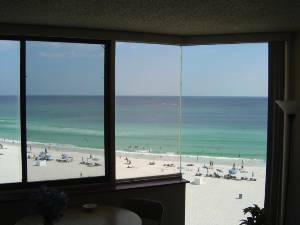 I have had several guests ask if the condo is actually Gulf front or if it's just that the complex is Gulf front. 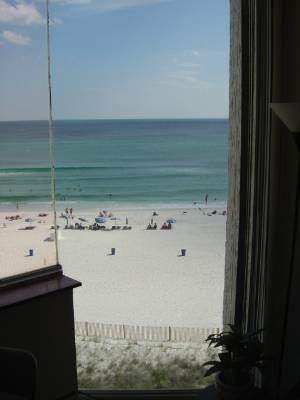 In this case, the condo is right on the Gulf and also has the direct view right out at the water and the beach. This fully furnished condo has just been completely redecorated including tile floors throughout. The condo also has an extremely comfortable Queen Size Bed and a full size futon, making it very comfortable for 3-4 Adults. The complex is extremely well maintained and has many nice amenities. 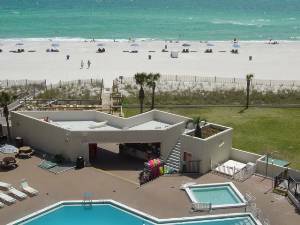 You will love the large swimming pool, kiddie pool, poolside snack bar, 2 story sun deck, grilling area, shuffleboard, and the lounge area on the beach. 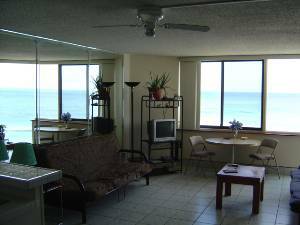 The complex is also very close to incredible restaurants, night clubs, golfing, water sports, fishing charters, and shopping. I'm an animal lover from the start and even have a degree in Wildlife Ecology. 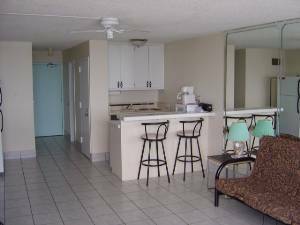 The condo is set up to be pet friendly, but the complex dictates no pets over 20 pounds. The condo complex put in a brand new Internet Cafe last year and the guests LOVE it! It's awesome to be able to stay in touch as much or as little as you want. Ask about new discounts for summer weeks!!! Truly very close to incredible restaurants, night clubs, golfing, water sports, fishing charters, and shopping. You can see why they call these the World's Most Beautiful Beaches!! Complex requires at least one adult over 25. Linens and towels provided, but please bring extras or anything like a special pillow. Weekly rentals are based on Saturday to Saturday stays. Deposit: Only $100 deposit upon booking. Rental rate paid at check-in. Cancellations and Refunds: The condo association imposes a minimum rental age of 25. Refund can't be given if folks rent the unit and then don't have anyone able to show ID to meet this requirement. Other Fees: Parking/Check-in Fee $15. No increase for long stays or on holidays. Prices subject to change.